A few weeks ago the founder of Refab, Eric Schwartz messaged me to say that Refab was going to be salvaging items from the interior and exterior of the Southern Funeral Home on S. Grand Boulevard and asked if I would like to photograph it before it was demolished. Of course I replied: Absolutely! The Southern has been vacant since 2010 and was put up for sale in 2011. A proposal that year to demolish the funeral home to construct a Dollar Store was denied, but in 2015, a proposal from Vecino Group of Springfield, Missouri that involves rehabilitation of the adjacent Parkside Apartments that fronts Carondelet Park was approved the St. Louis Preservation Board by a vote of 3 to 2. The St. Louis Cultural Resources Office had determined that the 1929 Spanish Colonial Revival style funeral home by architects George Kennerly and Oliver Steigemeyer was eligible for listing on the National Register of Historic Places, which would have made the building eligible for both Missouri and Federal Historic Tax Credits if it had been rehabbed. Instead of rehabilitation, the Southern Funeral Home is being demolished so that an addition can be added to the Parkside apartment building. The interior of the Southern Funeral Home features a beautiful large chapel, that with the exception of some minor vandalism, is in very good condition. 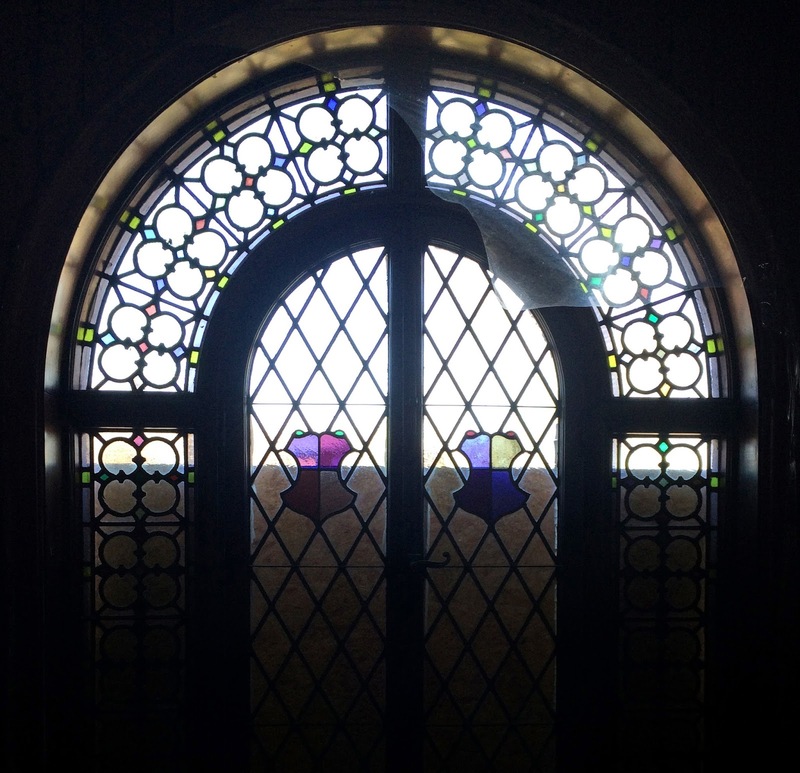 Most of the multi-colored leaded glass windows had been stolen. 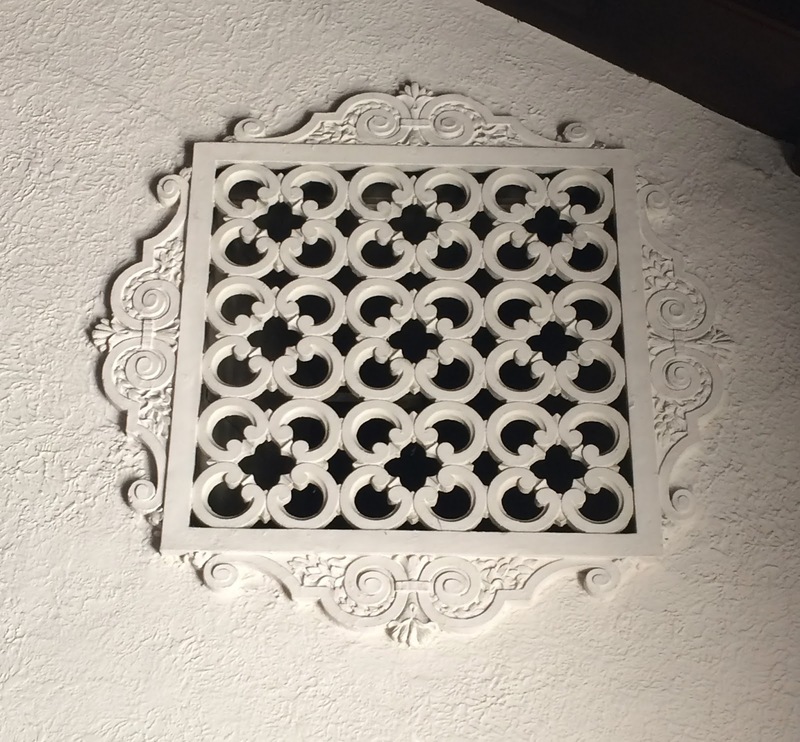 A close-up of one of the decorative plaster air grills at the front of the chapel. 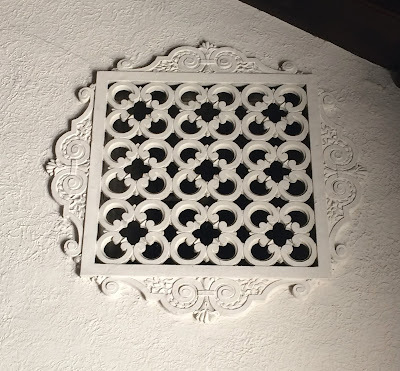 The rear wall of the chapel was composed of decorative plaster grills. Other than the graffiti, the grills are in perfect condition. The entry hall outside the chapel has a fair amount of water damage, but considering that I have seen video of smoke billowing out of this very window from a fire in 2014, this room and the interior of the funeral home in general was in better condition than I anticipated. Another long hall that runs the length of the funeral home parallel to the chapel and is in worse condition, with a fair amount of water damage. The damage however would certainly be repairable. Other than the crown molding, the hall was not ornamented. Another small room north of the main hall is also heavily water damaged. A reception room where the long hallway and the entrance hall intersect features a beautiful beamed ceiling that is in much better condition, with some smoke damage evident, but little to no water damage. The office in the northwest corner of the first floor contained one of the few fully intact multi-colored leaded glass windows. The apartment upstairs was also in much better condition than I had imagined it would be, with flaking paint and some vandalism being the main issues. The apartment features several kitschy trompe l'oeil murals throughout the living and dining rooms. In the kitchen, beneath some yucky 1970's sheet vinyl, there was some amazing multi-colored diamond patterned linoleum. The basement was somewhat of a mess with a couple rooms that were the apparent location of the 2014 fire. Fire damage however, was limited to a few rooms on this level. The construction of the building's floors are concrete joists with clay tile infill between, which is fairly common for 1920's commercial construction and was used due to its resistance to fire. While we did not do a thorough investigation, it was apparent that there was no structural damage to the building do to the fire. Terra cotta ornament was used sparingly on the buildings exterior. 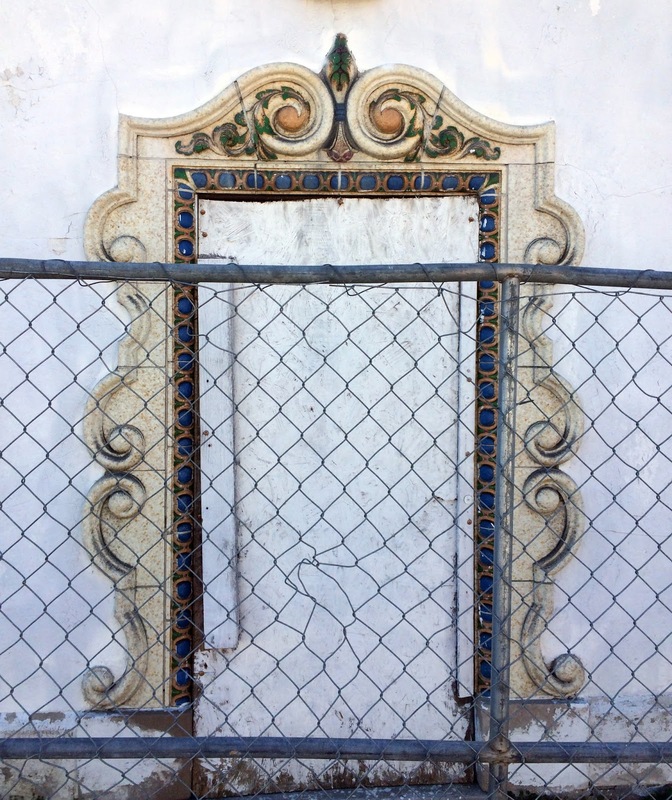 This multi-colored door surround was one of the most detailed examples. For the past week or so, Refab has been working to salvage all of this beautiful terra cotta, the remaining leaded glass windows as well as interior decorative items, doors, moldings, etc. Within a few weeks, demolition of the building will commence. If you are not familiar with Refab, they are a non-profit organization that provides training and employment opportunities for homeless veterans salvaging building materials and deconstructing buildings that are slated for demolition. Refab has a warehouse at 3130 Gravois where they sell the salvaged building materials. You can find just about anything you want in this treasure trove including doors, windows, decorative trim, hardwood floors, plumbing fixtures, hardware, cabinets, appliances, and a seemingly endless variety of one-of a kind vintage items. The vacant Parkside apartment building at the corner of Grand and Holly Hills is slated to be renovated as part of the development to be dubbed the Intrada. The development will provide a mix of affordable apartments seniors and supportive housing for youth aging out of foster care. Both of these are greatly needed uses, and the fact that the vacant Parkside building will be rehabbed is a very positive aspect of this development. I wish however that even a partial creative re-use of the Southern Funeral Home could have been either integrated into the development or developed along side it. This site plan that was recently published on NextSTL shows the existing L-shaped Parkside building fronting on Holly Hills with the new addition to the north, which will turn the building into a U shape. 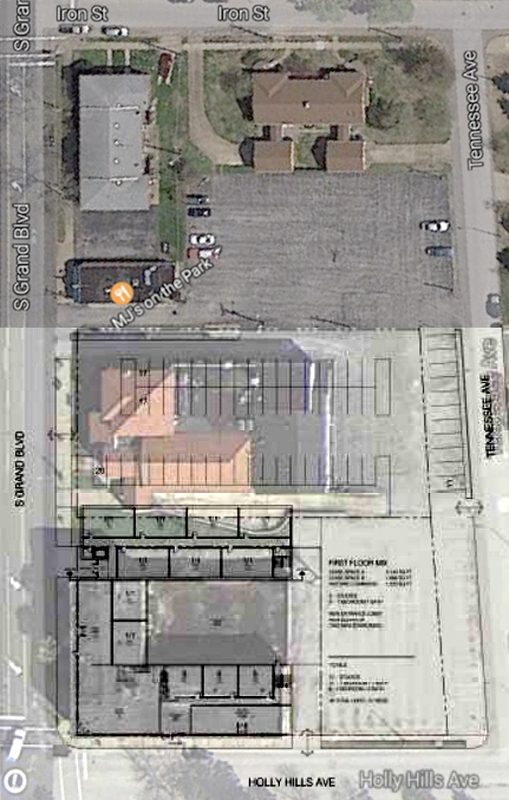 Surface parking will replace the Southern Funeral Home. One of the frustrating things about this demolition is that the empty asphalt lot behind MJ's on the Park is part of the funeral home property and is currently owned by the developer, but appears to be left out of this project. If the newer portions of the funeral home were removed (the rectangular area behind the red tile roof), retaining the original building, enough parking probably could have been created using the space behind and the unused lot to serve both the apartments and a new use for the funeral home. The parking lot immediately east of the Parkside building is owned by the New Testament Christian Church, which is located just across Tennessee Avenue. At the very least, the Preservation Board should have required that the new addition be rotated so that it fronts on Grand Boulevard, but instead, surface parking will now be the prominent street frontage replacing the funeral home as illustrated by the fenced area in the elevation drawing above. The Southern Funeral Home was likely doomed by a Development Report by ND Consulting that was done in 2009 for the Carondelet Housing Corporation, which discusses the potential for rehab with Historic Tax Credits, but then says that due to the configuration of the building, it should be demolished and the site should be redeveloped for something new such as a "stand-alone restaurant". This report was cited by the Cultural Resources Office in the Preservation Board agenda where it recommended the demolition request be approved. 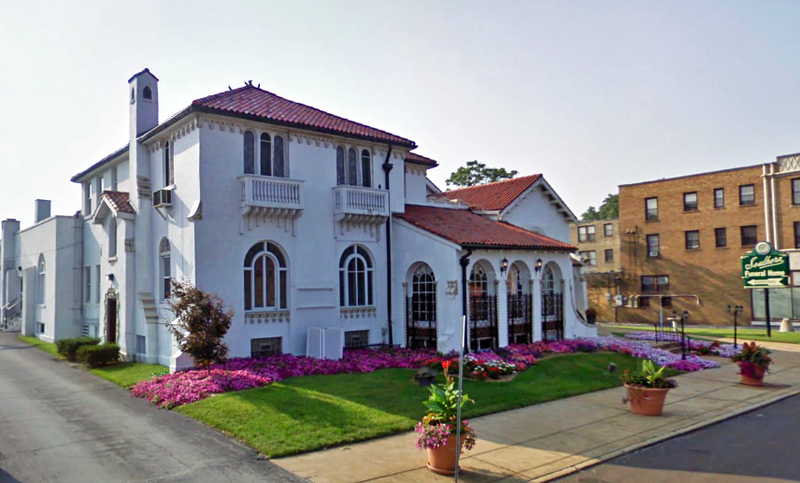 The loss of the Southern Funeral Home is unfortunate due to the rarity of good examples of Spanish Colonial Revival style buildings in St. Louis. If this demolition occurred in southern California or another area where this style is more prevalent, it might be just a mere blip on the radar screen, but in the Brick City, this loss really stands out. So sorry to hear this. My family used Southern Funeral home years ago. This was part of my stomping grounds. I wish people would rehab instead of demolishing these old bouldings. Europe still has old building being used and it makes it so quaint. This is frustrating- I'm a history teacher, landmarks association member, and avid Saint Louis history buff- taken photos almost 20 years of buildings and houses. This one always spoke out to me as one to be rehabbed- sad the store you mentioned has the window �� Great blog! Keep up the great blog! Here's a video of the interior from several weeks back. It is now demolished. What a shame...thanks for the post with the last pictures. Do you know if there are other examples of Spanish Colonial Revival style buildings in St. Louis? There's a vaguely Spanish style ex-funeral home, now a church, on Kingshighway south of Chippewa, but I have no idea when that was built. Pharma Medica Research Paid Clinical Trial for Healthy Males & Healthy Post-Menopausal Surgically Sterile Females To Participate in Clinical Research Studies near St. Louis, MO.